It had been a long time Ruggles Grill in Montrose was shut down right after the hurricane Ike hit Houston. And I think it's been even longer while we kept saying that we needed to go back to Ruggles after it finally reopened. We just kept going to its sibling Ruggles Green in upper Kirby for the yummy sandwiches and fire roasted tomato basil soup. We finally visited Ruggles Grill today, and we were excited about the new menu line up with locally harvested ingredients (Well, it's been a while they re-opened it, but at least it's new to us.) It was so nice to see our friend Vik, the manager back in the restaurant, and we had a nice chat. 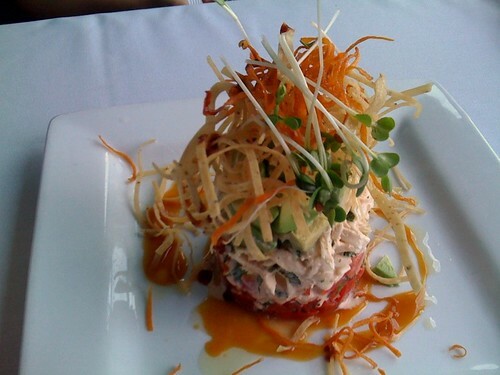 We started with Avocado Crab tower as an appetizer. On the top is tortilla chip sheds garnished with some radish sprouts. It looks like radish spouts are Chef Bruce's favorite garnish, or at least I see them on top of the many dishes he produced. Japanese people eat radish sprouts quite often, and I like the gentle spiciness. The yellow sauce was tasty, and I thought it was spiced up with jalapeño although I did not check what it really was. Yvonne and I never stopped enjoying the crab meat and avocado with fresh smell of cilantro until we completely cleaned up the dish. My entrée was Tenderloin filet mignon. I have nothing more to say but it was just right medium rare. 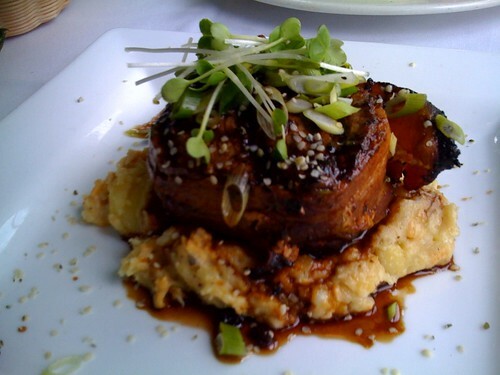 I also noticed there was some cooked raisins in the sauce for the meat that made the glaze gently sweet. The raisins looked so much smaller and delicately softer than what I usually see and eat, so I needed to confirm with Vik that it was really raisins. Vik also told me it's organic. There are so many more dishes we need to come back and try. Two thumbs up for the chef's creativity and Vik & staff's hospitality. Next: No. You are not multi-tasking. Just distracted.